Native to tropical Asia, the bamboo orchid (Arundina graminifolia or Arundina barbusifolia) grows to 8 feet with reedy stems and evergreen, grass-like leaves up to 1-foot long. Its 2- to 3-inch-wide flowers appear in clusters at the stems' tips in summer and autumn, each lasting for about three days. Those fragrant blooms vary in color from white to pinkish mauve with a darker purple lip. The Missouri Botanical Garden lists the bamboo orchid as perennial only in U.S. Department of Agriculture plant hardiness zones 11 through 12, but other sources consider it hardy as far north as USDA zone 9. A bamboo orchid growing in a lush garden. 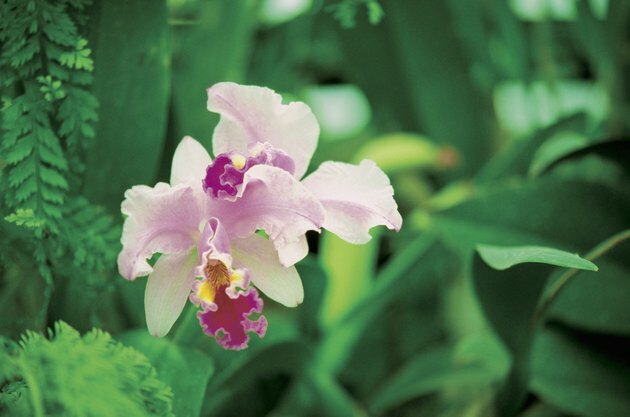 Due to its large size and preference for high humidity, this orchid generally performs better outdoors than indoors. If you wish to try it as a houseplant, a clump – which usually contains three to five canes – needs a pot at least 12 inches in diameter. The bamboo orchid isn't picky about its medium and can be grown in regular potting soil, sphagnum moss or a more typical orchid mix of 1 part organic potting soil, 1 part coarse orchid bark and 1 part sand. The bamboo orchid prefers full sun or at least partial sun, so position it on or near a south-facing windowsill where it receives temperatures between 60 and 80 degrees Fahrenheit. Keep the air moist around it by placing it in a humid room, such as a bathroom, or setting it atop a humidity tray. The plant is seldom bothered by pests or diseases. Water the orchid frequently enough that its medium or mix never dries out completely. Fertilize it once a week from spring to fall with a 20-20-20 plant food, mixing 1/4 teaspoon of the crystals into 1 gallon of water. Always follow label instructions. If possible, move the plant outdoors during the summer, setting it in shade at first, and gradually accustoming it to full sun. Water the bed about once every three days when there is no rain, or however often is necessary to prevent the soil from drying out. 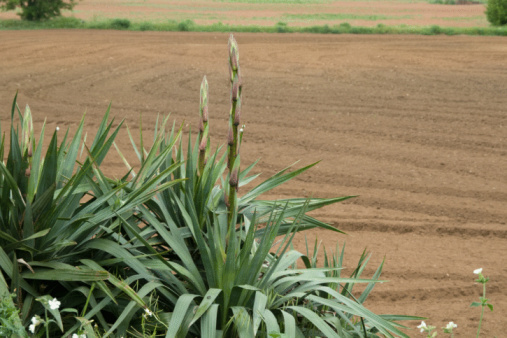 When all the buds on a cane have bloomed, snip that cane off near soil level with sterilized pruning tools. How do I Grow Lucky Bamboo Indoors?